This autumn flower arrangement features colorful roses in groupings with green hydrangea, placed in a short compact cylinder vase lined with a ti leaf. If a stylistic floral arrangement is what you are looking for, this bouquet is it! 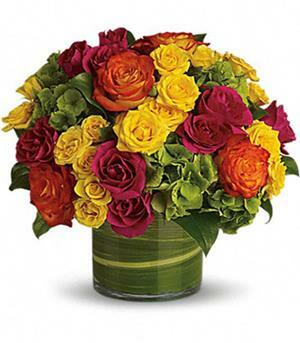 The modern look is created with multicolored roses in groupings around lush green hydrangea. The colors are a bit tropical in nature with a ti leaf wrap to finish it off. Order these beautiful flowers for a WOW factor from Four Seasons Flowers! Item Care Instructions: Check water daily and keep in a cool area.